The "Wallace & Gromit" creator makes a worthy successor to his best-known work. With all due respect to Pixar and Studio Ghibli, can we start acknowledging Nick Park and Aardman Animations as the innovators they are? Those who’ve seen the “Wallace & Gromit” shorts and 2005 movie tend to love them, but the studio responsible for that iconic duo doesn’t get a fraction of the acclaim. 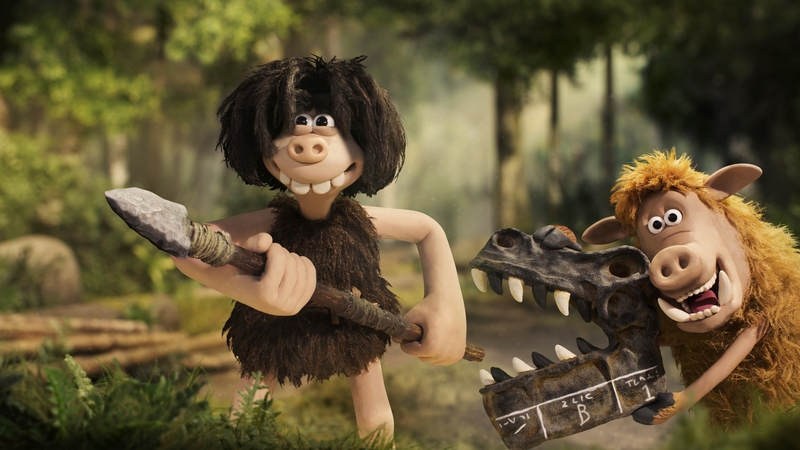 Maybe it’s because the British studio has never been especially prolific, but with “Early Man,” its first feature film since 2015’s delightful “Shaun the Sheep Movie,” Aardman once again reminds viewers that its stop-motion creations are consistently joyous spectacles. Beginning, as it must, with a primordial prologue about the asteroid that wiped out the dinosaurs — just as it strikes, two dinos who were fighting moments before embrace in fear — the film concerns a tribe of well-meaning cavemen whose happy existence is disrupted by the arrival of civilization: Bronze Age intruders show up one day, there to turn their communal cave into a mine so that Lord Nooth (Tom Hiddleston) can maintain his lavish lifestyle. Park, a four-time Oscar winner who created Wallace & Gromit 30 years ago, is stepping into the director’s chair for the first time since 2008’s “A Matter of Loaf and Death” short. He hasn’t lost his step, with his latest fictional world being both a departure from, and continuation of, his usual settings. At the center of it is Dug (Eddie Redmayne), Park’s latest affable protagonist whose good nature can’t stop him from getting into increasingly ridiculous situations. He and his cohort live in the crater left by the asteroid’s impact, which has grown lush and verdant in the centuries since it struck; the human price of progress was steep even then, as stone gave way to bronze and left the primitives in its wake. Park fashions this inevitability something akin to Mordor encroaching on the Shire: industry subsuming an old idyllic world. If that setup sounds too Luddite-friendly, it’s also quite funny: Dug is among the smartest of his tribe, which is led by the very old (read: 31) Chief Bobnar (Timothy Spall), includes a rock with a face painted on it and a pig named Hognob (voiced by Park himself). He feels like a Gromit stand-in and, though not as memorable a companion, is still good for some laughs. Under Nooth’s yoke, warring tribes settle their differences on the soccer pitch rather than the battlefield; England’s national team may be underachievers in the 21st century, but their predecessors in Real Bronzio were a dominant force to be reckoned with. And so it is that “Early Man” turns into a sports comedy of sorts, one in which the motley crew of good guys must somehow overcome an imposing squad that is in every way their better. That’s especially difficult when Dug’s tribe is exiled to the Badlands, where they’re besieged by giant mallards, harsh conditions, and a paucity of the rabbits they used to depend on. Their temporary home proves the ideal training ground, however, its cruel landscape and craggy formations making formidable obstacles that do a right proper job of preparing the underdogs for their big match. As ever with Aardman, the cleverest moments are also the most fleeting. Lord Nooth can be spotted reading a newspaper called the Prehistoric Times; a woman seeing sliced bread for the first time exclaims, “Wow! That’s the greatest thing since, well, ever.” The narrative as a whole is familiar, if not overly so, and after the Silent Era gags of “Shaun the Sheep Movie” it sometimes feels like “Early Man” could have gone further and been similarly ambitious. What really gives our heroes a potential upper hand can be best described by a scene from, of all things, Carlos Reygadas’ “Post Tenebras Lux.” Assembled on a rainy field, a rugby team huddles as their leader explains the key to victory: “They’ve got individuals; we’ve got a team.” That isn’t an uncommon message in an animated movie aimed toward kids, but it is a worthy thematic bedrock. “Early Man” opens in wide release on February 16.